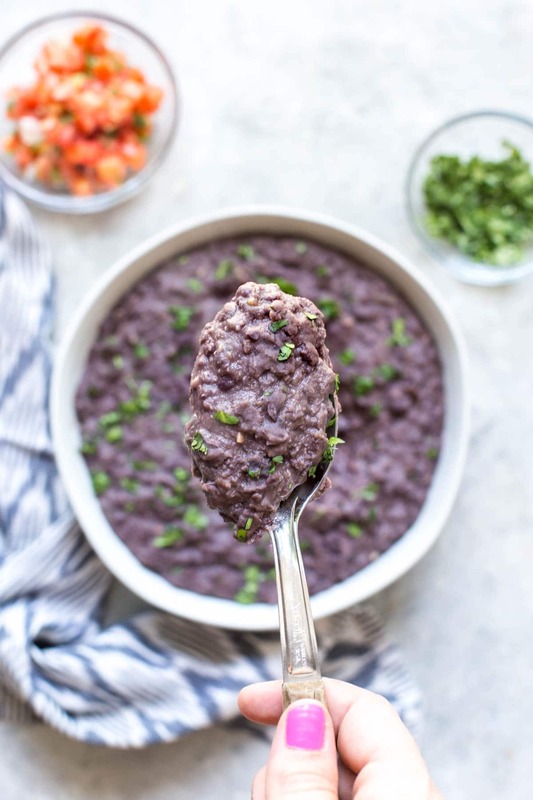 Make your own homemade refried black beans with only 5 ingredients and ten minutes. 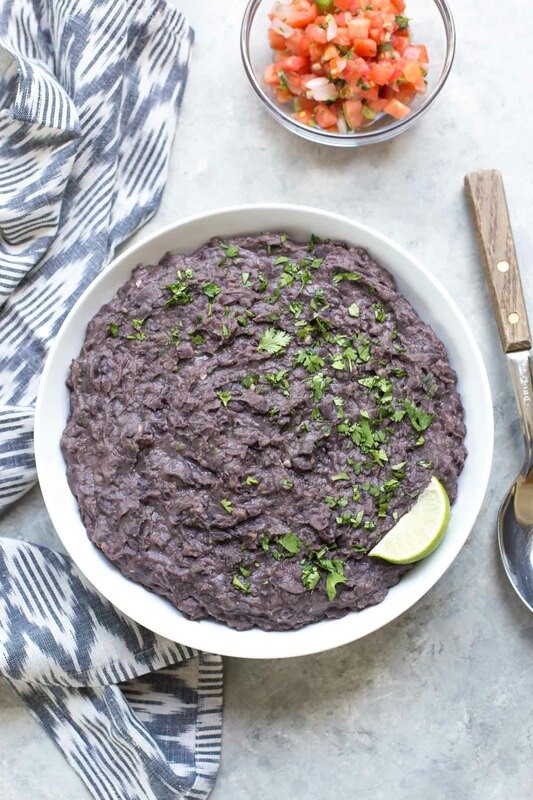 Dairy free & vegan, they make a perfect Mexican side dish. Makes 6 – 8 servings. Do you love the beans that come with your food at a Mexican restaurant? I don’t normally pay extra to get them, but if they’re already on my plate, I think they’re such a treat. I especially like when there’s still a bit of whole bean in there. On Valentine’s Day, we were supposed to go out with friends for dinner, but since Marc ended up working pretty late, I decide to make these honey chipotle chicken tacos at home instead. Of course, I was still craving those beans, so I tried making a quick batch on the stove while the taco meat was cooking. I normally prefer black beans anyway, so that’s what I used, and everything else was already in my pantry. 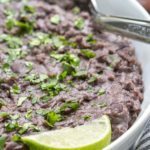 Are refried black beans healthy? 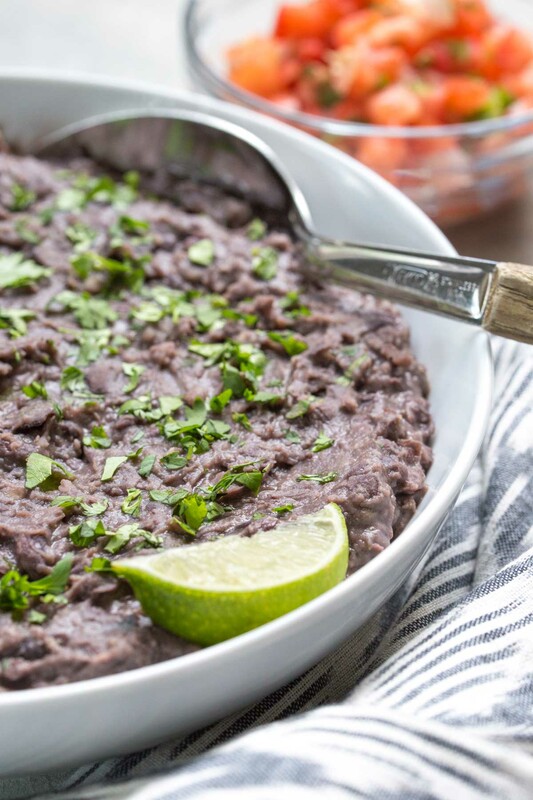 Traditional refried beans are made with lard and a decent amount of fats. That what makes them so flavorful and thick. I love making my own refried beans because I can control the ingredients that are in them. I normally use a little bit of extra virgin olive oil, which makes this recipe very low in fat. The type of fat you use doesn’t really make a difference. You can use any cooking oil you have, including coconut oil or canola oil. You could even use lard or butter (it won’t be dairy free). Use what you have and I promise it will work. You don’t need many ingredients to make this recipe, just black beans, olive oil, diced green chiles, garlic and cumin. If you don’t have diced green chiles, you could substitute a little chopped chipotle pepper, fresh jalapeño or even some crushed red pepper flakes. 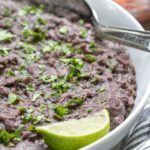 How do you make refried black beans? You want to drain the, but not completely. I like to drain the extra liquid on the top, but that’s it. No matter what you do, don’t rinse your beans. The little bit of aquafaba is is key to getting thick, creamy beans. Next, heat a large skillet or saucepan to medium-high. Add the olive oil, garlic and green chiles to the pan and sauté for about a minute. Stir frequently while they cook so you don’t burn your garlic. Add the beans and seasoning. Then dump in your beans, cumin and a big pinch of salt. Stir it all up, and then mash you beans until they’re smooth(ish). Do not drain your beans completely. The little bit of aquafaba is is key to getting thick, creamy beans. To get the beans the right consistency, you want to use a good old-fashioned potato masher. If you don’t have one, you can probably make due with the back of a ladle or maybe even a hand mixer. But, they’re really a great tool to have on hand anyway, so you should probably get one. You can mash your beans completely or leave them a bit chunky, which is why I like. Either way, the beans are done in under 5 minutes, and they’re just as good, if not better, than the beans from your favorite Mexican restaurant. 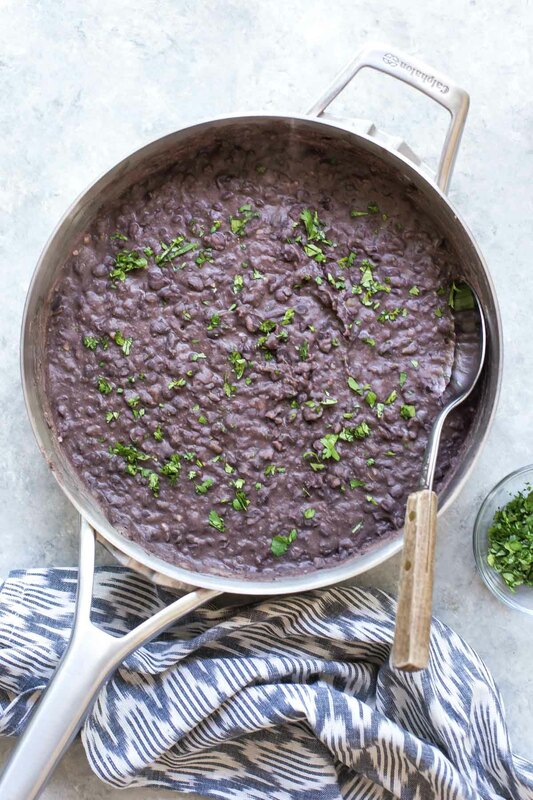 If you didn’t drain enough liquid from your can, and your black beans are too soupy, just simmer them for a little longer on the stove, stirring occasionally until they thicken up. 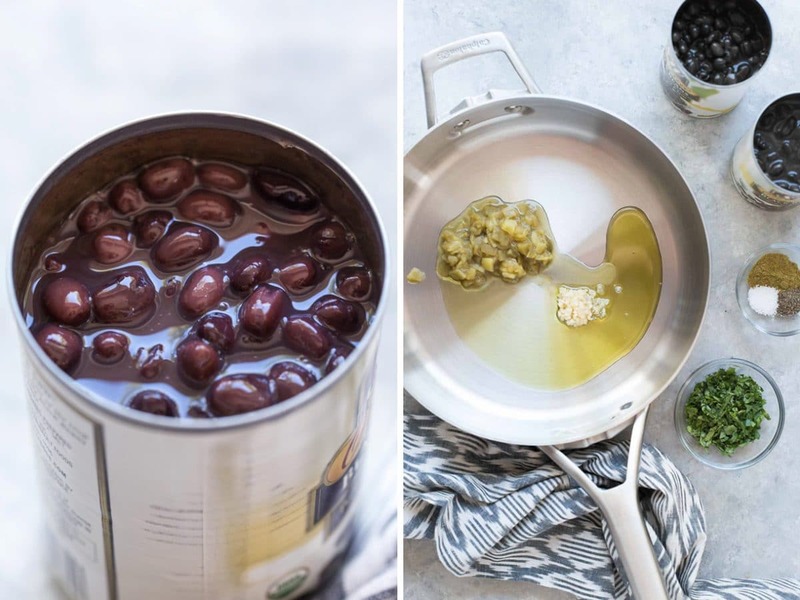 In a large saucepan, heat olive oil to medium-high and add garlic and diced green chilies. Sauté until fragrant, about 1 minute. Add beans, cumin and salt & pepper. As the beans cook, mash beans with a potato masher to desired consistency and stir occasionally to prevent sticking. Remove from heat when beans have thickened and excess liquid has evaporated. Top with fresh cilantro before serving (optional). Do not completely drain the black beans. 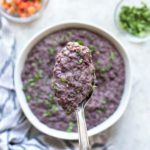 I love this method for refried beans! So yummy! These are a must in our home! 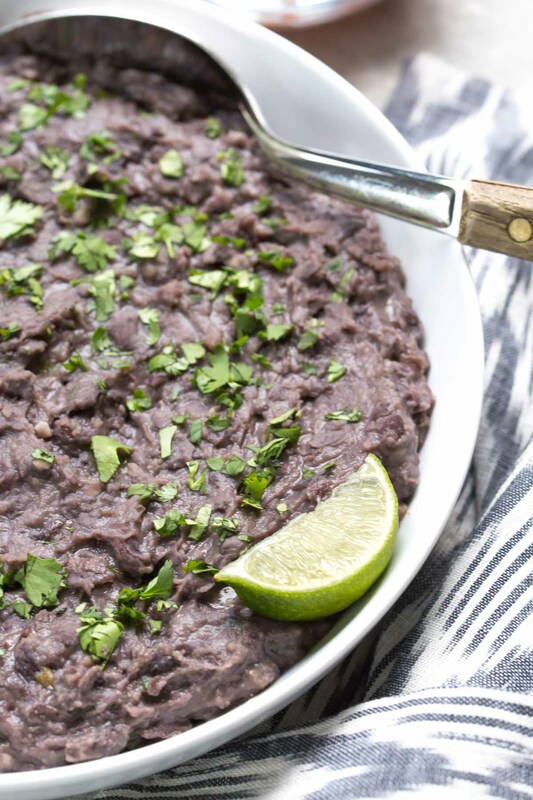 We use refried beans in recipes at least once a week -thanks for the awesome recipe!